“I am delighted to welcome the first Airbus A330-900 into our expanding fleet. Its unbeatable economics and efficiency will power our business forward,“ said Antonoaldo Neves, TAP Air Portugal CEO. “The A330neo will give us a lot of operational flexibility thanks to its commonality with the other Airbus aircraft in our fleet. This aircraft will be the first equipped with the new Airspace cabin, which is a new concept shaped to meet TAP’s ambition to offer the best product in the industry to our passengers, “he added. 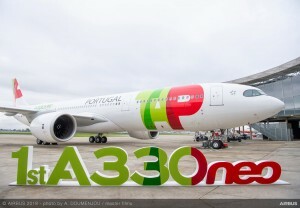 “Handing over the first ever A330neo to a long standing Airbus customer, TAP Air Portugal, is a very important milestone for Airbus,” said Guillaume Faury, President Airbus Commercial Aircraft. “Through continuous innovations, the A330neo, our newest widebody aircraft, will offer maximum value and efficiency to our customers and superior comfort to their passengers. This occasion marks another step forward to meeting our industry’s goal for sustainable aviation,” he added. The A330neo is a true new generation aircraft building on the A330’s success and leveraging on A350 XWB technology. It incorporates the highly efficient new generation Rolls-Royce Trent 7000 engines, and a new higher span 3D optimised wing with new sharklets fully optimised for the best aerodynamic performance. Together these advances bring a significant reduction in fuel consumption of 25 percent compared with older generation competitor aircraft of a similar size. Moreover, new composite nacelles, a fully faired titanium pylon and zero-splice air inlet technology provide the A330-900 with state-of-the-art aerodynamics and acoustics. Today, TAP Air Portugal operates an Airbus fleet of 72 aircraft (18 A330s, 4 A340s, and 50 A320 Family aircraft). The single-aisle fleet includes 22 A319ceo, 21 A320ceo and four A321ceo, one A320neo and two recently delivered A321neo.